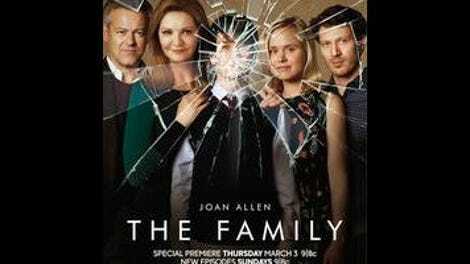 Thursday, March 3, at 9 p.m. Eastern on ABC, then moves to Sundays at 9 p.m.
For a network show with a patina of cable prestige, ABC’s new drama The Family is surprisingly quick to crank its burners up to 11 and get the pots boiling. 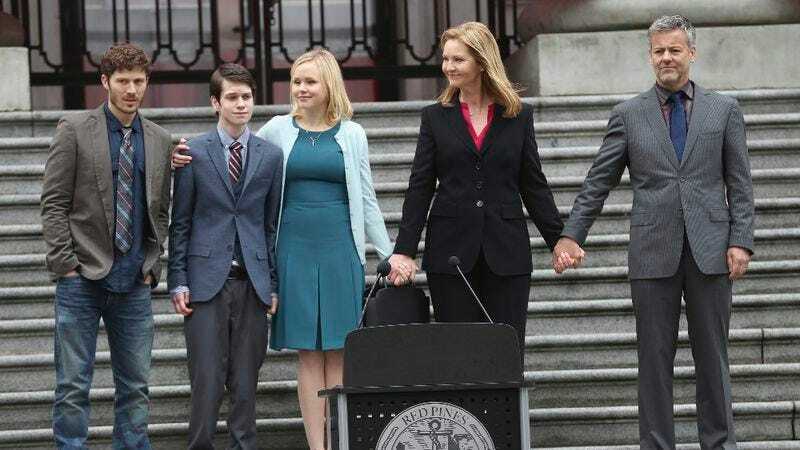 The Family is primarily billed as a political thriller, and boasts a cast of ringers, including three-time Academy Award-nominee Joan Allen, Andrew McCarthy, Friday Night Lights’ Zach Gilford, and Alison Pill, most recently seen staffing The Newsroom. But political intrigue isn’t the first thing The Family delves into, nor are its most well-known actors the first-seen. The opening shots are of Adam Warren (Liam James), who stumbles disheveled and disoriented into a gas station and asks for a ride into town. He makes it to a police station where he identifies himself as the same Adam Warren who went missing 10 years prior and was presumed dead, while his neighbor Hank (McCarthy) was jailed for his murder. Only after establishing its central mystery does The Family awkwardly back into its political milieu. Allen stars as Claire Warren, Adam’s mother, who was an unpolished city council hopeful when Adam was kidnapped, but has since risen to become mayor of fictional Red Pines, Maine. Her political career fades into the background upon Adam’s return, which along with Hank’s release from prison, roils the small community as much as Adam’s disappearance and Hank’s conviction. Claire’s priority is helping her son reacclimate to a normal life after spending a decade being sexually assaulted in a woodland bunker, and pressuring police sergeant Nina Meyer (Margot Bingham) to find the real culprit, as Meyer failed to do as the young detective originally assigned to Adam’s case. Adam is as much a part of the mystery, with his careerist sister Willa (Pill), Claire’s right-hand woman, and ne’er-do-well brother Danny (Gilford) at odds over how concerned the family should be about Adam’s odd demeanor. But once it plants those seeds of doubt, The Family ricochets back to being a political thriller, with Claire announcing her gubernatorial run so she can strengthen child-protection laws and spare another family the agony the Warrens have endured. The Family’s combination of local politics and unsettling family strife borders on inappropriate at first. But the show quickly clicks into place once it becomes clear that the purpose of Claire’s career is to set the stakes for the mystery surrounding Adam, which is the nexus of a whole host of Warren family secrets that extend far beyond his abduction. It’s a pulpier, soapier show than the one ABC is advertising, but it’s all the better for it. Creator Jenna Bans spent years under the tutelage of Shonda Rhimes as a writer for Grey’s Anatomy, Private Practice, and Scandal, and The Family bears the closest resemblance to the latter show, in which the sharp-elbowed world of politics is the surface layer of a story about much deeper and more unsettling human folly. Bans is not as much interested in politics as in how the Warrens’ public face, and the importance of maintaining it, leads to the family’s undoing once Adam’s return unearths a host of scandals, each equally capable of derailing Claire’s career. The performances are the real draw, beginning with Allen, whose performance sells the synergy between Claire’s maternal grief and her career ambitions. Claire could easily come off as a cynic who rode a wave of public sympathy into office, but Allen lends her some much-needed humanity. Gilford and Pill are as reliable as ever, and like Allen, they’re able to ground the characters even as the story around them becomes uncomfortably busy. But the real draw is McCarthy, who is genuinely terrifying as Hank, a not-so-innocent man who became the chief suspect in Adam’s disappearance for all the right reasons, including a relatively mild sexual offense. Hank’s release from prison after Adam is found alive is only the beginning of his story, and by the end of the second of two episodes screened for critics, he seems to represent as much a threat to the Warrens as he did after Adam went missing. It’s a departure for heartthrob emeritus McCarthy, and he leans into the performance to the point of rendering himself unrecognizable. The uncomfortably sympathetic pederast has become a bit of a trope, particularly when well-known actors use such a role to revive their careers by playing against type, like Kevin Bacon in The Woodsman or Jackie Earle Haley in Little Children. But McCarthy is impressive all the same, though it remains to be seen whether such a character works as part of an open-ended series or if Hank’s constant, ambiguous presence will overtax the audience’s capacity for characters with flaws. Hank embodies the biggest challenge facing The Family, which is building a brisk, pulpy mystery out of incredibly fraught material. It can’t be a coincidence that James’ character shares his name with Adam Walsh, one of the country’s most well-known abducted children, and the subject of NBC’s 1983 TV movie of the same name. That similarity is unfortunate, as it forces the audience to reconcile the real-life horror of child abduction with a show that can’t tonally carry such a heavy weight. The Family is superficially about the aftermath of a human tragedy, but with its red herrings and whiplash reveals, it’s hard to take as seriously as the subject matter deserves. The second episode parallels Adam and Hank’s experiences of coming home to places no longer familiar, an idea that makes sense intellectually but watches uncomfortably, as if the show is trying too hard to equalize their victimhood. But it’s a better problem to have than the one faced by so many recent ABC dramas, including Resurrection and The Whispers, which took similar themes of familial grief and turned them into rudderless extraterrestrial procedurals. The Family is more earthbound than that, and has a sturdier foundation of acting and writing talent. But tonally it’s a high-wire act, one that will be impressive should The Family manage to pull it off, but runs a real risk of trivializing an extremely sensitive subject.